Nasa has used its high-resolution imaging satellite at the Red Planet to look down on the Curiosity rover and acquire a new picture of the recently landed six-wheeled robot. The vehicle appears as a double dot. The view from the Mars Reconnaissance Orbiter (MRO) has been colour enhanced to emphasise certain ground features. These include the disturbance in the soil made either side of the vehicle by the rocket powered crane that lowered Curiosity into Gale Crater a week ago. “We can clearly see Curiosity – it’s like two bright spots that we see, and their shadows. 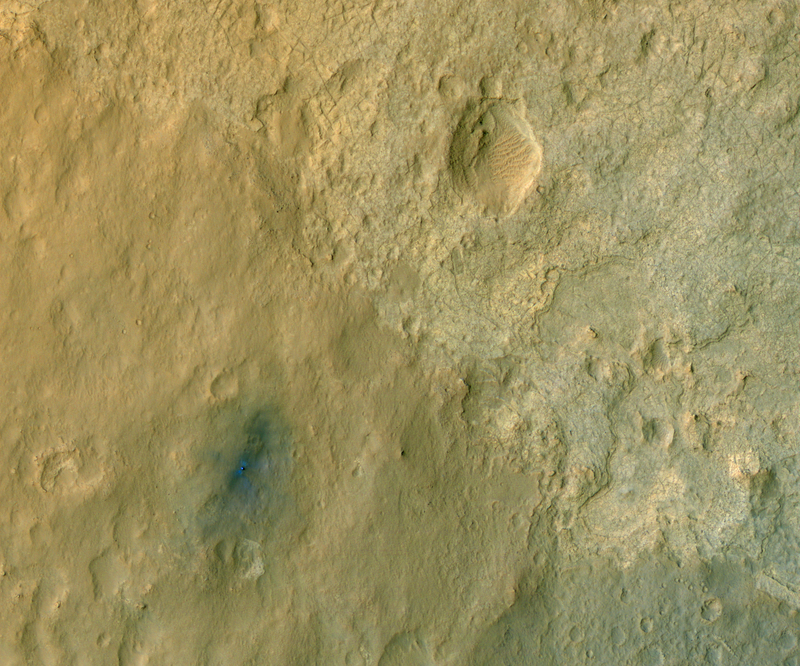 And then it’s surrounded by the blast pattern from the descent stage – those little blue fans right next to it (false colour blue),” explained Alfred McEwen, the principal investigator on MRO’s High Resolution Image Science Experiment (HiRise) camera.